I have a not-very-secret passion for stationery. I bet lots of people who read this do too. 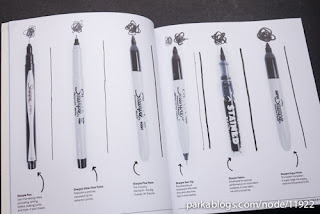 Stationery can be very specific and if you make art with your stationery you are bound to have specific brands that you always use, that special pen that almost brings you to tears when the manufacturer decides to discontinue it. The Sharpie is one of those brands. 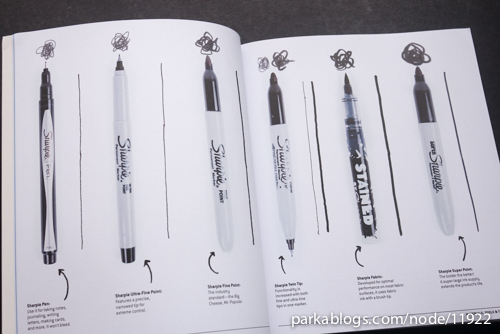 When I think of a sharpie I have a specific pen in my mind - the fat pen shape with its robust tip and ink that obliterates whatever it covers, on pretty much any surface - well I've pretty much always used the black, it's my go-to permanent marker. 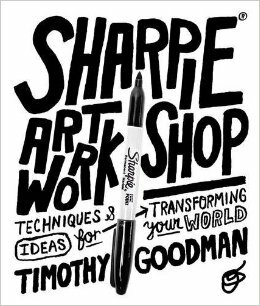 When I spotted the Sharpie Art Workshop book I first thought it was odd that it was so specific about the brand - was this just a selling tool for Sharpie? It might be that, but it's also a great resource for anyone wanting a little kick along in their creativity. I was also quite surprised hen I opened it up to discover the range of other Sharpies available - way more that what I've owned and used. I felt an urgent need to get to an art shop and add some to my collection so I can get into action. Author, Timothy Goodman, (his excellent website is definitely worth a look) is a designer/illustrator/art director from New York, so a man with much practical experience of his craft. We don't just get to see his ideas either, there are some great illustrators who share their ideas here (including one of my favourites Kate Bingaman Burt whose daily purchase drawings must have used up a mountain of black pens). Try out different sorts of mark-making, making patterns and using the pens on more materials than you'd have thought possible (decorating a pair of shoes has caught my eye). I'm looking forward to having a go at some of these projects myself.